Brendan Boyle moved to head the Ministry of Social Development at the end of 2011, and in 2012 Colin MacDonald became Secretary of Internal Affairs, and the third Government CIO. 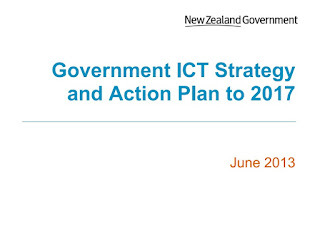 In 2013, a new strategy document was released - Government ICT Strategy and Action Plan to 2017. The strategy identified four focus areas - Services are digital by default; Information is managed as an asset; Investment and capability are shared; and Leadership and culture deliver change. These are underpinned by System Assurance with a focus on the risks and quality of ICT investment from a whole of government perspective. Following a significant amount of customer research, development began on a new portal. 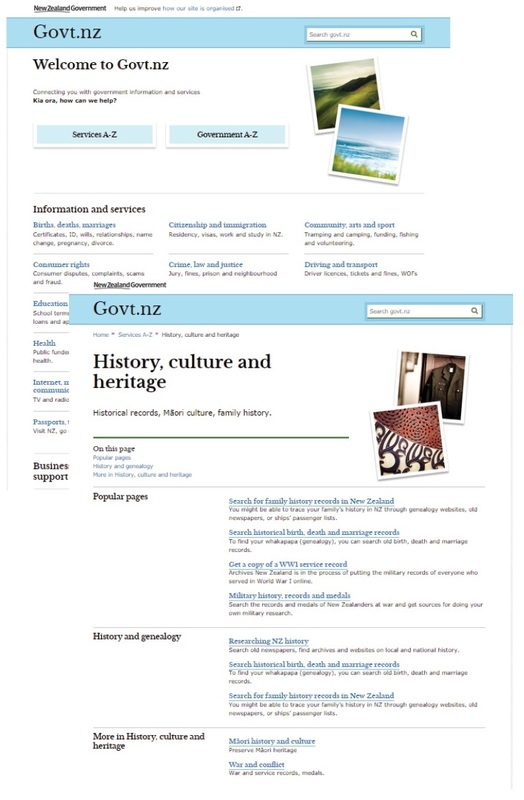 Initially working with the source code for gov.uk, the NZ team conducted alpha and beta tests, collected user feedback and eventually made the decision to move away from a portal to a consolidated information source, with links to agency sites for transactions. 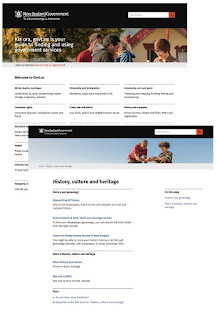 The design used in the beta version marked the return to the long form of website, with scrolling to see the full content. The feedback from the final beta version was that the site was too formal, it needed a more “Kiwi” feel, and that it was “too boring”. Changes were made and the new site was launched in July 2014 with information from 44 agencies, structured in the way that users said they looked for information. It also marked the return to www.govt.nz from www.newzealand.govt.nz. 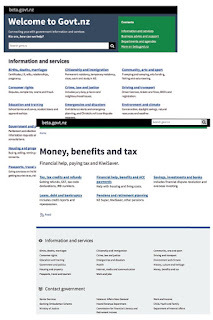 The site was no longer referred to as 'the government portal'; its remit had shifted: "Govt.nz is your guide to finding and using New Zealand Government services." As Colin MacDonald put it "Govt.nz is an example in action of putting the customer at the centre, and keeping the customer at the centre." After the site was launched in July 2014, the Govt.nz team received a lot of feedback about the site. Some of it was about how the site looked, and its structure; the public felt that the site did not look like a government site and were not sure that they could trust the information on it. The new design lacked a distinctly New Zealand feel. As a response to this feedback, Govt.nz looked different in February 2015. The changes were described by the team: "The pale blue colours and snapshots are gone. So are the serif fonts. We’ve lost some of the white space and are using stronger visual cues. Our focus is on ensuring our site looks authoritative, and making it easier for people to find what they need. We’ve begun work to restructure the site, too. We’re aiming for fewer levels, and more intuitive content groups - so there are fewer clicks to find what you are looking for." The changes included a more authoritative header and a clearer visual hierarchy. The results in user testing feedback were positive – “it looks friendly, like New Zealand”, “official looking” and “efficient, warm and friendly” – and the new site was released in February 2015. 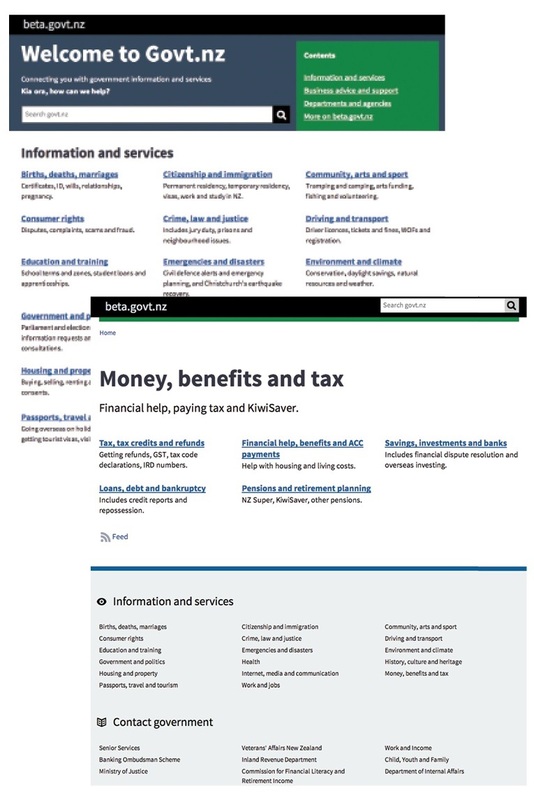 As well as consolidating government information to make it easier to find, access and use, the Govt.nz team has also developed functionality to support open and transparent government. 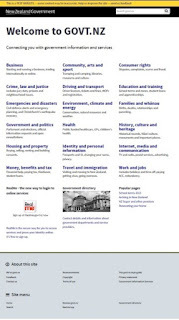 For example, listing all consultations taking place across local and central government, which people can view by topics of interest or by agency. 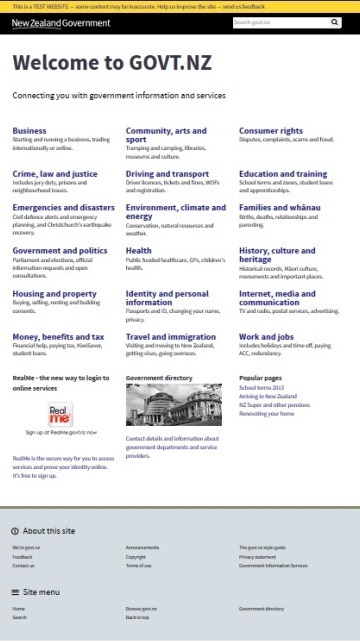 Government head office contact details are also available to be downloaded from the Government A-Z, via an API. The next step will be to integrate services into people’s lives, and work has started work on modelling how services are used around four life events, though Colin MacDonald admits “this is, sadly, a relatively slow process.” The first life event to be examined is the birth of a child. The hope is that, rather than having to register with a range of agencies one by one, “you’ll be able to go to one place, and everything will be there to access and for you to use”, allowing parents to access such services when it’s convenient for them. 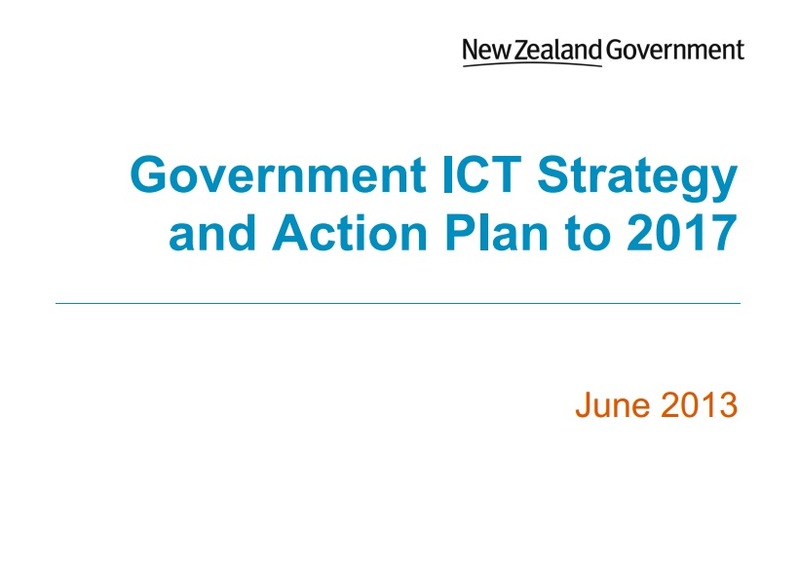 The team use the webtoolkit.govt.nz as an interactive space to share information and lessons learned in the web space. Accessibility is critical to ensure everyone is able to use the new online channel, and the team have conducted research that shows low literacy, language and internet access are key barriers to finding government information online. As a result, the team are working on the design and test of non-text and low-text content, and translating key information. It is clear that after 20 years, the spirit of connecting government with the public using the internet continues to drive the work programme.